Parliament will return on Thursday, Dec. 3, with a speech from the throne to follow the next day, government House leader Dominic LeBlanc announced after the Liberal cabinet's first meeting. The new Liberal government will move quickly on key promises, including tax relief for middle-class Canadians, amending anti-terror laws and an expedited plan to bring in thousands of Syrian refugees. Parliament will return on Thursday, Dec. 3, with a speech from the throne to follow the next day, government House leader Dominic LeBlanc announced after the cabinet's first meeting. LeBlanc said implementing new measures to cut taxes for the middle class and increase them for those making more than $200,000 will be brought in as a top priority. "The prime minister has made it clear to us that it is his hope and his intention that the tax measures could be in place for Jan. 1, and that's frankly one of the reasons why we're asking Parliament to come back in the first week of December," he said. A series of ministers were grilled by reporters on everything from pulling out of the military mission in Iraq and Syria, to when marijuana will be legalized, to whether Canadians can expect a fall fiscal update. Most declined to divulge specifics until they have been briefed by senior departmental officials. But Minister of Immigration, Refugees and Citizenship John McCallum confirmed that bringing in 25,000 Syrian refugees by year's end remains a "firm objective" of the government. He said it will require an "all-of-government" approach. "I will be getting briefed intensely on this. We will be reaching out to provincial governments, to NGOs, to international organizations," he said. "I think we will find a great desire across the country to help us achieve this objective." McCallum said he will work with his counterparts in Defence, Health and Public Safety to map out a course of action. The federal government will also partner with provincial and municipal governments, non-government organizations and international institutions, McCallum said. Public Safety Minister Ralph Goodale said his department will do its part to ensure the Syrian refugees are properly screened before entry to Canada. Goodale called his portfolio a "huge responsibility" that touches on a number of departments. One of his "urgent" issues will be to amend Bill C-51, the controversial anti-terror legislation. "The principle is clear, and that was laid out by Mr. Trudeau in the election," he said. "That balance between making sure Canadians are safe and making sure that their civil rights and the values of Canadians are properly protected." New Treasury Board President Scott Brison said the former Harper government "gratuitously" attacked the public service and that Liberals would restore a "culture of respect." 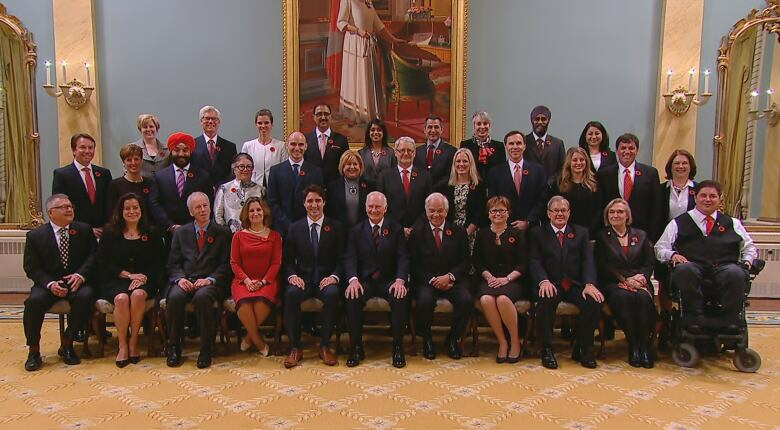 Prime Minister Justin Trudeau and his 30 new ministers met in Centre Block to map out the government's priority agenda, just hours after being sworn in Wednesday morning. Trudeau officially became Canada's 23rd prime minister at Rideau Hall, the Governor General's official residence in Ottawa. An estimated 3,500 people turned out to watch it unfold on large screens set up on the grounds. After the 90-minute ceremony, Trudeau circulated in the crowd, shaking hands and posing for photos. Trudeau's 30 cabinet appointments include a mix of rookies and experienced politicians, and there is an even number of men and women. Justice Minister Jody Wilson-Raybould, a former B.C. regional chief, said she is honoured and privileged to serve in the portfolio. She said the physician-assisted death issue is a "priority" for the government and that she would have more to say in the days and weeks ahead.